Poker is a casino game with many variants, which means it’s always providing something new and engaging for players. However, before you dive into the world of poker, it’s best to get to grips with a more basic version like Casino Hold’em. You can play Live Casino Hold’em here at 21.co.uk whenever and wherever you like, offering the perfect opportunity to practice playing the game before you delve into more complicated poker variants. Casino Hold’em is a simpler form of poker which offers a whole lot of action. It can however be a little confusing to new players, so we’ve provided a detailed guide to the game and explained each stage of a typical round. What is Casino Hold’em Poker? Casino Hold’em is a popular poker variant of Texas Hold’em poker. The main difference between Casino Hold’em and Texas Hold’em is that Casino Hold’em is played against the house rather than against other players. This makes is the perfect poker game to get started with, as it’s easier to follow and also happens to be the most popular online poker game currently here at 21.co.uk. There’s also huge player scalability online as an unlimited number of players can place their bets and play against the dealer at one table simultaneously. You’ll find this poker variant is played in a classic online casino environment and bears resemblances to other card games like blackjack and baccarat, hence why it’s named Casino Hold’em. To be able to play poker we must first learn the basics of the game. The first point of call is to place your bet. Just like in a real casino, Live Casino Hold’em requires you to do this by placing chips on the relevant sections of the poker table, which is the circle labelled Ante. You may also wish to place an additional AA or Bonus side bet, but this is not required. The AA side bet is placed on the poker value of your own two cards and the first three community cards, if a pair of Aces is found. The payout is dependant on the rank of the poker hand. Once bets have been placed you and the dealer will both be dealt two cards each - yours will be facing up and the dealer’s will be facing down. Three cards will then be laid in the centre of the table, face up. Cards in the centre of the table are known as community cards, as both you and the dealer will use these to try and form a winning poker hand. Another round of bets are placed at this stage. A fourth community card will then be placed in the centre of the poker table, referred to as the ‘Turn’, alongside the initial three. After the fourth community card is drawn, another round of wagering will occur before a fifth community card is placed on the table, called the ‘River’. You can then place your final bet and the dealer’s cards will be revealed. Each player’s hand will be compared with the dealer’s and any winnings will be credited according to the paytable. The aim of this poker variant is fairly straightforward - form the best poker hand you can. In Casino Hold’em, this will be done using your two cards and the five community cards. Since this poker variant is played against the house, the objective is to beat the dealer’s hand. There are ten possible hands, which are ranked in order of value, from the famous Royal Flush all the way down to the High Card. 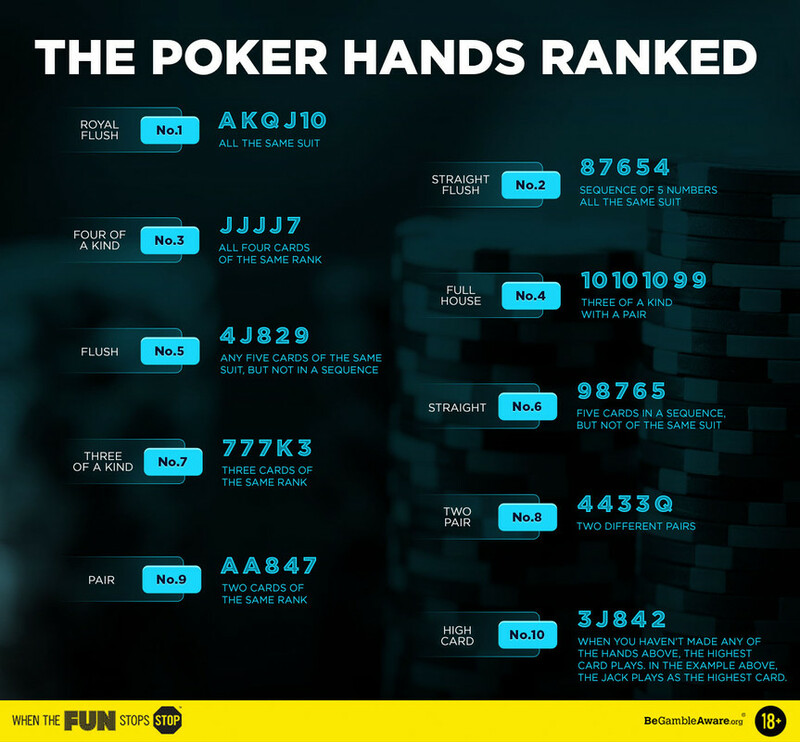 Check out the infographic below to see the poker hands ranked. As you can see, the most valuable hand you can possibly form in poker is the Royal Flush, which involves all face cards plus an Ace and a 10. This makes a consecutive set of cards from Ace down to 10, and all five of these cards must be the same suit. Less valuable hands involve three cards of the same rank, pairs, sequences and lastly, the High Card, which is played if you haven’t made any of the nine poker hands. When playing poker, there are two options available to you - call or fold. Let’s take a look at these in a little more detail. If you choose Call, you are choosing to continue the game and place the Call bet, which is double the Ante. The Call bet will then be placed on the Call bet section of the poker table automatically if you are playing poker online. If you choose to fold, you will lose all wagered chips and sacrifice the current hand. You will essentially quit the round. You can still watch the rest of the game if you want to, but you cannot participate until the next round. Whether you choose to Call or Fold is entirely up to you. You can make this decision with each new round of wagering, and decide whether you want to progress to see if you can beat the dealer or call it quits there and then. The convenient thing about Live Casino Hold’em is that you can see your own two cards alongside the community cards, as the game will show you the best poker hand you can currently form. This is a great feature which you can use to make a decision on whether to Call or Fold. The catch is that you cannot see the dealer’s cards, which is what makes this game interesting. You can make your next move quickly and easily using clearly marked buttons which will be visible on your screen at the appropriate times. Casino Hold’em is played with a standard 52 card deck, excluding the Jokers. Only one game is played with one game of cards, which are shuffled after each round has concluded. The dealer must hold a pair of fours or higher to qualify. If the dealer doesn’t qualify, you win automatically. In this instance, the Ante bet pays according to the paytable. Wins are determined using five out of the seven available cards. The highest paying hands are formed and compared to determine winners. Bonus bets are separate to the Ante and are therefore not affected by the Call or Fold decision. Bonus bets are evaluated on the first hand of five cards only. If you hold a pair of Aces or a more valuable combination, you will win the Bonus side bet and paid according to the Bonus paytable. So there you have it - a complete guide to the popular and easy poker variant, Casino Hold’em. You can play this epic poker variant right here at 21.co.uk, complete with professional live dealers and all of the features you need to get the most out of your online poker experience. If you want to venture out and try other poker variants, check out Live Ultimate Texas Hold’em and Live Caribbean Stud Poker.